In order to improve the self care abilities of the patients with bronchial asthma a 'Self Care Manual' (a Booklet of 26 pages) on bronchial asthma was prepared. An interview schedule was developed to evaluate the usefulness of the manual. The validity and reliability of both these instruments were established. Five hundred and twenty three diagnosed patients of bronchial asthma (260 in the study group to whom the self care manual was given and 263 controls to whom no specific instructions were given) were included in the study. Emotions like 'tension', 'excessive laughter', 'sadness', 'happiness' and 'anger' etc. that triggered the symptoms were studied. The effect of self care manual on other emotions (*a total of 8 items) like 'anxiety due to the disease', 'tension of taking medicine' and 'fear of death' etc. was also studied. Both groups were followed up at 2 weeks, 6 months and 1 year while the same interview schedule was administered on each visit. It was observed that the emotion scores decreased significantly in both the groups (8.08±5.5, 5.89±4.88, 1.44±4.63 and 1.19±4.01 in the study patients, whereas 8.50±6.30, 7.88±6.21, 7.35±6.03 and 5.97±5.81 in the controls) at 0 weeks, 2 weeks, 6 months and 1 year respectively. The emotion scores were significantly less in the study group as compared to controls (unpaired 't' = 3.57, 8.52 and 7.67) at 2 weeks, 6 months and 1 year respectively (p<0.001) Multiple logistic regression analysis showed that the odds ratio of study group patients showing significant improvement in emotion scores was 3.34 (95% CI, 1.78-6.25) and 4.26 (95% CI, 2.34-7.63) at 6 months and 1 year respectively as compared to controls. We concluded that patient education (self care manual in the form of a booklet) made significant improvement in the emotions in patients with bronchial asthma. 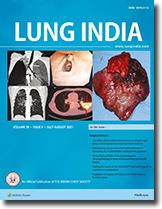 Background : The effect of a short course of prednisolone on lung function and bronchodilator responsiveness in COPD is debatable. 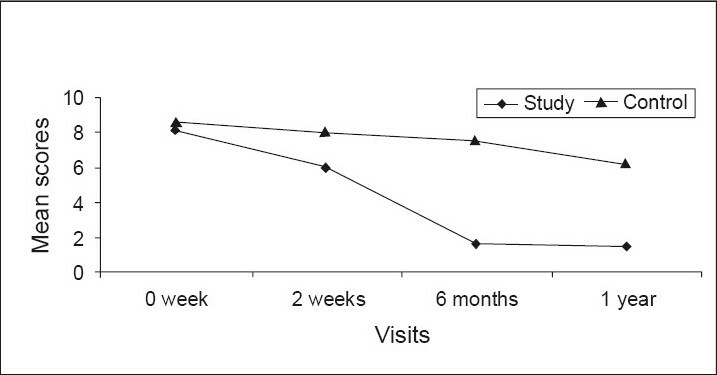 Methodology : After baseline spirometry and measurement of response to inhaled salbutamol, 31 patients with COPD were randomized to the steroid group (given 40 mg/day prednisolone for 7 days) while 29 patients were assigned to the control group. All the patients continued on their usual medication based on published management guidelines. The lung function and response to salbutamol were reassessed on day 8. Results : Both FEV 1 and FVC increased after salbutamol to the same extent in both the groups on the two test days. The proportions of FEV 1 and FVC responders were also similar in the two groups. The bronchodilator response was not reproducible and several responders of day I became non-responders on day 8 and vice versa in both the groups. 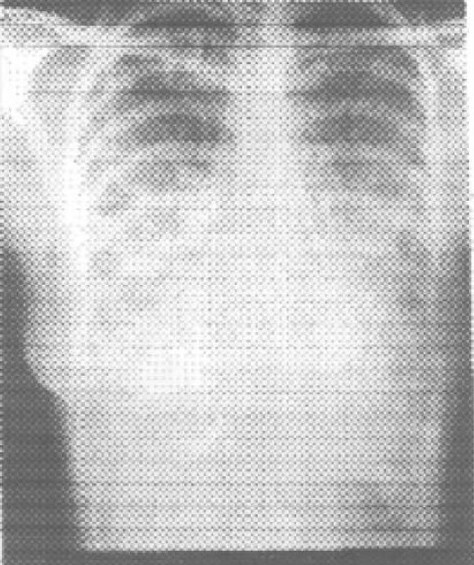 At the end of 1 week, the prebronchodilator lung function showed similar improvement in FEV 1 and FVC in the two groups. 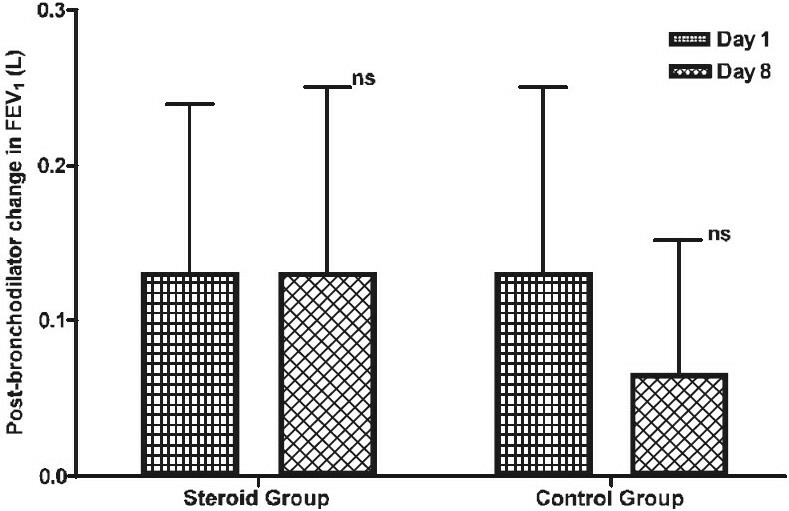 A multiple logistic regression procedure failed to identify factors that could predict a steroid response. Conclusions : A short course of prednisolone does not favourably affect lung function and bronchodilator responsiveness in stable COPD.